Steadfast Herbs is a small herb farm located in Pescadero, CA, offering medicinal seedings, fresh herbs and a line of holistic plant medicines to support folks in caring for their physical, mental and emotional health. We use organic practices to grow over 50 varieties of medicinal plants on half an acre, a scale that allows us to maintain a close connection with our plants and products. 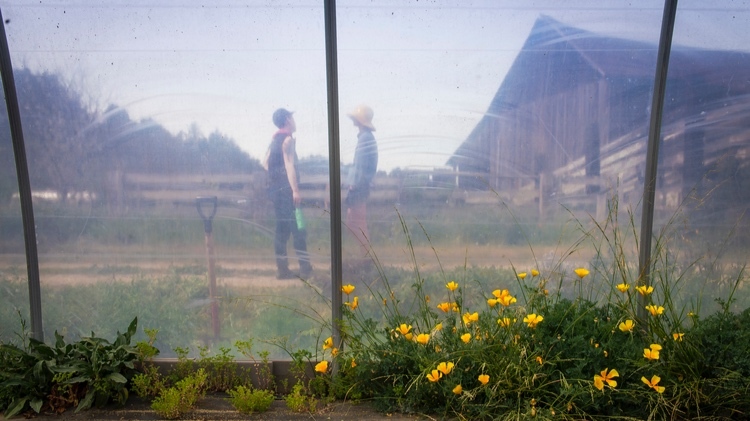 Steadfast Herbs was started in 2014 by two radical queer herbalists- Lauren Anderson and Finn Oakes- to provide the Bay Area with access to locally grown herbs and herbal medicines. Our work is rooted in a deep appreciation for the plants, a longing for collective liberation and an anti-capitalist ethic. Finn Oakes is a writer, educator and clinical herbalist with a commitment towards healing justice. After many years of self-study in Western Herbalism, Finn graduated in 2015 from the Clinical Energetic Herbalism program at the Blue Otter School of Herbal Medicine. They currently use the power of plants, practices and intuition to help clients build resiliency to the impacts of trauma. In addition to farming and building a practice, Finn often wanders the woods and the beaches of Pescadero. You can find out more about their work at: finnoakes.com. Lauren Anderson is a makeshift builder, a cat enthusiast, and a kitchen witch. She studied with Janet Kent and Dave Meesters of Terra Sylva School in Marshall, NC. Lauren works from a ‘radical vitalist’ perspective (a term coined by Kent/Meesters), utilizing plants to support the body's innate force, while working within a framework that is trauma informed, body positive and based in harm reduction. She is a science nerd and is constantly curious and can often be found talking out loud to the plants in the garden.